In a tribute to one of nature's most curious creatures, The complete penguin journeys to Antarctica to explore the inner secrets of the penguin colony. In a witty but authoritative text, author James Gorman has combined first-hand experience, natural history and personal observation in one affectionate, informative volume. Complemented by superb colour photographs from Frans Lanting, one of the world's leading wildlife photographers, James Gorman takes us on a romp through the favourite haunts of the penguin and en route explodes many of the myths about this bird. He examines the ins and outs and ups and downs of their lifestyle, and explains how they survive in their complex, rowdy, gregarious community. We learn how they meet, mix, mate and mature. We witness the dangerous life of the penguin chick. And we look at the true penguin: an incredibly graceful sea creature who actually flies underwater, using wings, not feet, to propel itself along. 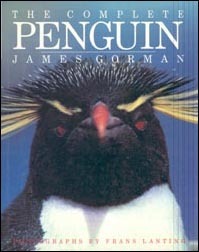 James Gorman also investigates the evolution of the centuries-old relationship between penguins and people, in the course of which this delightful bird has been unfortunately eaten, seriously studied, captured, taken to zoos and finally visited in its natural habitat by tourists. The complete penguin is a verbal and visual celebration of a much-loved, unique personality from the natural world.